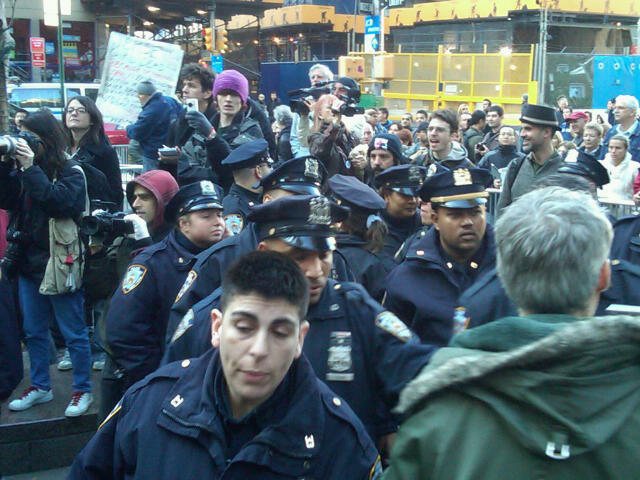 LOWER MANHATTAN, November 24, updated with video -- As Occupy Wall Street celebrated Thanksgiving amid guitars and turkey dinners, police arrived and threatened arrests for criminal trespass due to noise. Video here and below. Some called it cliche and other, "police state," as drumming was brought to a close. The drummers consented -- "just for today," one said -- and other protests were announced, including at the Egyptian embassy in support of those protesting in Tahrir Square. In the crowd was "White Hat," who earlier in the week proposed canceling the Occupy Wall Street observation mission to Cairo and returning the $29,000 allocated to the General Assembly. As reported by Inner City Press, that proposal failed. But the mission has not gone. Now another stop might be Sana'a in Yemen, where democracy and accountability activists are being shot for opposing the immunity deal given to strongman Ali Saleh, in a deal crafted by the Gulf Cooperation Council, Saudi Arabia and the Obama administration behind them. Click here for Inner City Press' story on the deal. After the standoff on Thanksgiving, under the watchful panopticon eye of the NY Police Department watchtower over Liberty Square, many in the crowd suggested celebrating in peace. Occu-Pumpkin-Pie, one of them called out. Marching on the banks will have to wait another day. Watch this site. Footnote: also in the crowd was former Philadelphia police department Captain Ray Lewis, in uniform, who told the Press that NYPD "white shirts" should not be involved in tussles with protesters, and that the tear gassing of a sit-in at University of California - Davis was indicative of mismanagement. He got a good reception.